Laurie Here - Contemporary Fiction and MORE - Book Reviews: #FREEDOM TO #READ #GIVEAWAY HOP! July 2-9th! Thanks to our Sponsors, Bookhounds and I Am A Reader! 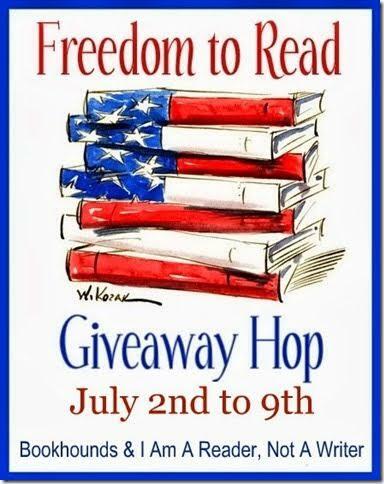 Welcome to the Freedom to Read Giveaway Hop hosted by our Sponsors listed below the photo up above! THE WINNER WILL BE ANNOUNCED THIS SUNDAY, JULY 26th after both Hops are over and when Remember Mia is over,too. Thanks for coming by! I had been ill for several weeks, so I was not able to answer all of the comments that were left through July. One day I would be okay, then I would be ill for the next week. It was a strange month and I'm glad it's over! I seem fine now! Thankfully! I hope you did not have any problems while you were here? Were you able to enter this Giveaway? You will need to scroll down with the arrows on the form. The blogs' screen - anywhere you put these forms - are too small to fit the entire form, therefore, you need to use the arrows and scroll down to see the very first question. I HOPE you enter! It's an EXCELLENT book that is up for grabs! Thank you, again, for coming by! I LOVE visitors!!! Oh, me!!! LOL! What you'll need to do is copy and paste that LINK and put it in the address bar of your browser that way. I was hoping the link would be live and you could just click on it, but nope, it's not live. Go ahead and do what I explained, and that is the NEW Giveaway Hop!!! Hi, umm I don't see any form to fill out! I'm Judy Schechter, jsnacc@yahoo.com, and I follow you on bloglovin. I saw your comment, but just like in the reply I wrote up above in Ann's reply comment I wrote to her, I was so sick this July, I would be fine one day, then sick for a week! Drove me NUTS! It did not stop, either. I hate when that happens! After that loads, scroll down. You'll see sailboats and words that say "Beach Reads Giveaway Hop". That is something you 'would have' seen here at THIS link, except it is gone now because it is over. It could also have been a different scene, too. Google has several different scenes you can choose to make the forms look nicer! After the Hops are over, I have to remove the entry forms so no one else enters them after the Giveaway is over and then they wonder who 'won' the Giveaway, but they didn't realize that the contest was really OVER. That is why the entry forms are removed AFTER the contests are over, like right now. So with this particular entry form that you just pulled up, you must use the arrows and scroll through the entry form. Try playing around with this one. If it takes you a few times of trying and playing around and I end up seeing 5 to 10 entries, I'll KNOW you are TRYING to figure out HOW to enter this Form!! LOL!!! Once you get a message that shows you a T to Tweet the contest and an F to share it on Facebook (you are NOT required to!!) the form asks if you want to go somewhere else or if you want to come back to the Hosting Blog? I would come back HERE to the Hosting Blog because next there are other Giveaways, too! Always look up in the LEFT SIDE COLUMN! There will be a NEW RELEASE posted later today, after 9:00pm, that you can enter to win that book, too! Or, you can leave the blog - whatever YOU want to do! This NEW one is a GREAT beach read!!! I'm going to email this reply to you, too! I'm going to have you come HERE first, then have you go to the CURRENT Giveaway Hop! If you have ANY questions, please email me and don't be afraid to ask!! Send that to laurieisreading at gmail dot com and I will ALWAYS help you out! (Just a little hint to help you out with your email address - don't type it like you did because the internet has things called "bots" (I think of them as little Pac Men rolling around every computer screen, and when it sees an email address, it eats it up! Then it takes that email address and sets you up to get ALL KINDS OF SPAM!!! You don't want that!! See how I mixed my email address up a little bit? That helps tremendously to STOP the Pac Men from even spotting your email address! It WAY lessens the chances of you getting SPAMMED. I HOPE that helped??!!! Anything else I can do for you, just ask me! I ALWAYS WANT to help!